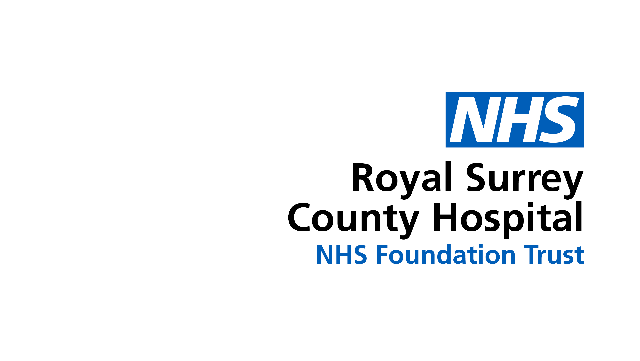 The Royal Surrey County Hospital NHS Foundation Trust provides services from one acute hospital in Guildford and two adult community services hospitals across Surrey. We employ over 4,000 staff and serve over two million people locally and regionally. We have recently been rated as 'Good' by the Care Quality Commission (CQC) and 'Outstanding' for being responsive to people's needs and for our maternity services and 'Good' for being caring, effective and safe. We believe that our people are the key to this success and the fact that going the extra mile is inbuilt within our teams. The recent appointment of a new CEO means you would be joining the board at an exciting time. The Royal Surrey County Hospital NHS Foundation Trust is a public benefit corporation authorised since December 2009, under the National Health Service Act 2006. It is a single-site hospital, based in Guildford, which serves a population of more than 330,000 across south west Surrey; and a tertiary cancer centre, offering state of the art diagnostic and treatment services to a population of 1.2million. As a NHS Foundation Trust, we have a 26-strong Council of Governors and over 8,000 public members. We employ 3500 members of staff making us one of Guildford's largest employers. In addition, the hospital is supported by a thriving group of 500 volunteers all of whom provide valuable services on an independent, voluntary basis. These divisions are supported by Corporate Services led by Executive Directors. The Trust also has two subsidiaries which offer the incoming Trust Secretary the exciting opportunity of being involved in not for profit and limited company governance at the same time. Act as Secretary to the Board, Quality , Audit , Nomination, Remuneration Committees. Support to the Chairman, Board members and executive management. Organise and prepare agendas and papers for Board meetings, committees and annual general meetings. Take minutes and draft resolutions and statutory filings for limited companies. Play a pro-active role in following up on action points from meetings. Support in relation to and co-ordination of board effectiveness reviews. Previous experience gained in a semi-senior or senior role. Solid understanding of corporate governance issues and best practice. Experience in arranging and managing board and committee meetings. Gravitas and diplomacy with developed influencing skills to affect change. The ability to prioritise work and to work well under pressure.